There is a small community of Chinese still living their life in Turkey, mostly temporary expatriates. While a few hundred Chinese students are enrolled in various Turkish universities, so you won’t feel completely out of place. Most people in turkey are from the Xinjiang region of China. They have come in large numbers since the early 1950s from the northwestern provinces of China, and as part of their migration to the Middle East; many chose to settle down in urban centers of Turkey. Today, they have effectively associated themselves with the local economy and can be seen practicing in various forms of trade. Turkey has been protesting the treatment the Chinese mete out to the largest Muslim group in their country but this does not impact their tourism industry and they do not bother the Chinese tourists. Some groups however have reportedly engaged in various attacks against Chinese nationals and interests based in Turkey. In 2009, the Chinese Foreign Ministry warned its citizens in Turkey "to remain vigilant and ... avoid crowded or sensitive places" after a series of threats were made on Chinese people and facilities. Keeping the political turmoil aside turkey is a beautiful place to visit. Some of the most famous and admirable places one can opt for when they are to visit turkey are Blue Mosque, Sultan Ahmet Camii is one of the most beautiful mosques ever built. Completed in 1616 by Mehmet Aga is among the best in its class and a scared place to visit and spend an evening together with your family. 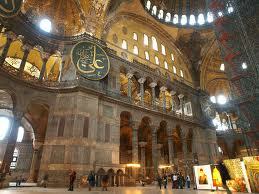 The largest church in existence when it was built is great masterpiece of Byzantine art. The church was sacked by the Latin’s during the 4th crusade in 1204 and many of its treasures taken to the west but its beauty is still intact and is worth one’s time. Ephesus an important trade and religious center is one of the oldest ancient cities still preserved with a history dating back the 12 C BC. During the Roman period its population reached approx. 250,000. The spring water at Pamukkale is a natural wonders because of its unique geological formation formed over 14.000 years. It is said to posses’ therapeutic qualities which heal many skin ailments and many more such qualities. Cappadocia lies in a triangle formed by the three main towns of Kayseri, Nevsehir and Nigde is a high plateau in Central Turkey at an altitude of 1000 m. The city of Pergamon was founded on a hill overlooking the Caicos plain. It became one of the cultural and an intellectual center in its merry days is still in existence since the 8th C BC when Aeolian Greek colonies settled in the area. The city Sardis another historical city remains to watch has a great historical importance attached to it. It was the capital of the Kingdom of Lydia founded on the banks of the famous golden-bearing river Pactolur has many legends associated to it. A Greek colony since 13th C BC Aspendus is located in the ancient region of Pamphylia is an existing settlement of Hittites. Alexander the Great claimed the city from the Persians and during the Roman period it was an important port city and now a world famous tourist site. Actually there is bigger than a small community of Chinese living in Turkey. Especially in Istanbul.